A straightforward, visual approach to learning the new PowerPoint 2013! PowerPoint 2013 boasts updated features and new possibilities; this highly visual tutorial provides step-by-step instructions to help you learn all the capabilities of PowerPoint 2013. It covers the basics, as well as all the exciting new changes and additions in a series of easy-to-follow, full-color, two-page tutorials. Learn how to create slides, dress them up using templates and graphics, add sound and animation, and more. This book is the ideal "show me, don't tell me" guide to PowerPoint 2013. 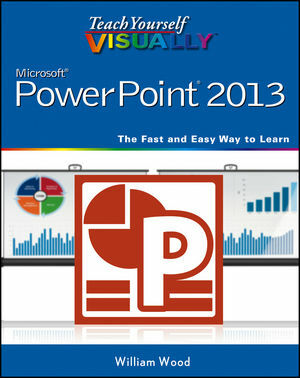 With Teach Yourself VISUALLY PowerPoint 2013, you have the power to make a remarkable presentation! Bill Wood (Chicago, IL) is a graduate of Milwaukee School of Engineering (MSOE) where he studied Biomedical Engineering. His expertise lies in Microsoft Excel, Microsoft Access, and Visual Basic for Applications (VBA), which he has been working with since 1995. He develops and maintains applications for various clients as well as working as an instructor and counselor on topics covering the entire Microsoft Office Suite. He teaches Microsoft Excel, Microsoft Access, and VBA at seminar style classes, and at one time taught for CompuServe as a certified instructor.